Married couples argue. It's not a huge secret, EVERY couple fights. And sometimes it's about something really trivial and pointless. But couples will still fight because that's how relationships work. People are annoying, and we piss each other off sometimes. It doesn't mean the love isn't there, it just means that we need a little space from time to time. Marriage is a lot of work. It requires communication, compromise and understanding of one's needs and desires. We didn't really see much of Mufasa and Sarabi's marriage, so i chose them to represent this reality. Considering that Sarabi does seem like a stubborn character, and Mufasa has a pretty short temper, i'm going to guess that these two used to fight a lot. But the love was definitely there. A less common reality than arguing, but still a very common marital problem. When one (or both) spouses have to work a lot, it can often leave the other feeling alone and neglected. This can cause depression and anxiety in the sufferer. But with the proper help and communication, this problem can be fixed. One just has to identify the problem, before it gets worse. I chose Simba and Nala for this, because while we do see their marriage more than the other two; they don't really do much together. At least not in Simba's Pride. Nala virtually disappears in the second one, only appearing to recite incorrect wisdom and support Simba by...standing in the background. Yeah, i'm not a huge fan of what they did to Nala in the sequel, she's pretty useless and I don't particularly enjoy that (but i digress). Simba seems to spend most of his time and energy running the kingdom and obsessing over Kiara's safety. So, it wouldn't surprise me if Nala began to feel lonely, I certainly would. Don't hate me for this. It's a known fact that one in three marriages ends in divorce. Sometimes the person you're with; will leave you. It'll be heartbreaking, and it won't be fair, but that's life sometimes. There were three unions/marriages in TLK: Mufasa & Sarabi were separated by death, Simba & Nala were still together by the end of the second movie, so who does that leave? Yup! Kiara and Kovu. You could argue that they didn't really get married at the end, but there was some kind of union ceremony and most fan fiction writers say that they do, so I'm going to say they got married too. Now, before you bite my head off; I didn't choose Kiara & Kovu for this just because I dislike them (which I do), I actually have good reasons to think that it'll end this way. First of all, their age. Kiara and Kovu if they were human, I'd say they'd be about 16-18 years old (in human years). That's a little too young to get married. At this age, we aren't fully matured yet; emotionally or physically. Young people, especially young guys; aren't ready to settle down at that age, they still have a lot of testosterone and need to experience their young lives at the fullest. To settle down that young?? Not fricken' likely! Yeah, Simba & Nala were young too, but not THAT young. You can tell by the size of Simba's mane compared to Kovu's, Simba's mane was full, Kovu's was not. 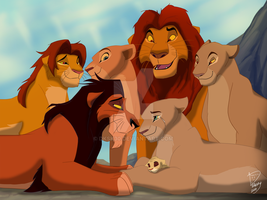 So I'd say Simba would have roughly been in his 20's or so when he and Nala reunited. Secondly, Kovu's upbringing. Kovu was raised to kill, Zira filled his heart and soul with hate and anger. That's something that can't be fixed in an instant, not even 'love' can erase the damage that Zira had done. He was no less than brainwashed from early childhood. Any and every psychologist will tell you that; to overcome brainwashing is a long and complicated process, and is sometimes irreversible. Zira damaged him, to the point of no return. Kovu wouldn't know how to be a good partner, it's not like he even had a father figure either. Through little fault of his own, Kovu would be naturally/instinctively aggressive and abusive due to his upbringing. Yes, it's a kids movie, obviously they just ignore this fact of basic psychology, and I'm NOT suggesting they should show this as it is. But I'm just further stating my claim as to why Kiara and Kovu are doomed. Thirdly, what would stop him from leaving? Aside from Simba probably killing him, and having nowhere to live if he did. But really, Kovu has no real obligation to stay. If Simba is still in charge, Kovu could just up and leave. Simba and Nala needed to stay together, they were to rule the Pride Lands as King and Queen once Scar was pushed off the throne. Then they had a child together, and a long history, so together they stayed. But really, if Kovu left the Pride Lands while Simba was in charge, they could just find another suitor. It wouldn't be fair to Kiara, but that's how it would work. Plus, to me; Kiara & Kovu are the weakest TLK couple in the franchise (despite nearly the entirety of the sequel being dedicated to their romance). Mufasa and Sarabi's relationship was pretty down played, but you could still see the love they obviously had together before they were divided (and likely reunited) by death. Simba and Nala spent most of their childhoods together, and no doubt developed a strong bond. They were separated by tragedy, reunited by a bizarre coincidence, fell in love, banded together, threw Scar off his throne and took back their land. They had a child, and worked together to ensure the life of the Pride Lands. Kiara & Kovu roughly had a similar circumstance, but much MUCH weaker. They only knew each other for less than two days before 'falling in love'. Picking up a Pocahontas vibe right here! Yeah yeah, they stopped the war between the families and united the prides, but i just didn't feel the connection between them. All i can really think about when watching them are 'High School sweethearts'. Yeah, they look cute together, but you can't help but think that it most likely won't last for more than a few years. There are exceptions of course, but they're very rare. Before you comment telling me how 'wrong' I am about Kiara & Kovu, could you separate your personal preference for me? Don't base your opinion around how much you like these characters, if you like them, that's fine! But try and see my point of view from a logical standpoint, if Simba & Nala were more likely to divorce, I would acknowledge it. But the odds really are against Kiara & Kovu, whether you want to admit it or not. Personally, if Kiara and Kovu spent a year together with their relationship, it would’ve been better possibly. Scar and Zira aren't a canon couple though..the films never specified exactly what their relationship was, we never saw them interact. I know but Zira is the closest thing we get to Scar having a love interest at all. Again though, perhaps they never even met. It was never shown, therefore; not canon. It still holds suspicion considering how much Zira talks about Scar and that deleted scene of her talking/fantasising to him. Still could have just been a fangirl. Again, no canon confirmation on their relationship. I get that there is no Canon confirmation but they must've had SOME kind of relationship.Zira says that Scar chose Kovu to be the next King and had her with the responsibility of raising him so he must've at least trusted her.Not to mention Nuka and Vitani being the elephants in the room. She could have just been delusional. Or maybe it's like Scar with the hyenas all over again, lying to your army in order to manipulate them for the sake of gaining power. The writers were too lazy to write a backstory on her, or explain the huge plot hole gap between the first film and the second. So, theories don't really mean anything. If it's not canon, I'm not including it. Why you do have some points, and I agree with you on all of these. They aren't really too young when you consider lion lifespans. Sure, their personalities make them seem young, but thats because it's a kids movie. Other than that, you're spot on. I think it would be awesome if you could make one literal lion king draw about simba eating worms. I mean seriously, this is lion, how he can be healthy if he would eat only bugs? He would have to eat alooooooooot of worms. Oh, don't worry. I'm sure a nice BM is the perfect solution for marital problems. My mom and dad got married when my mom was 17, they hadn't dated for too long and hooked up not long after they met. Not only did my dad have a bad upbringing, but he had a short temper. That to me sounds a lot like Kiara and Kovu. They were a pair of high school sweethearts who's love grew as they were together. My mom and dad are still happily married today. 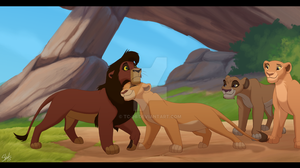 I do wish that they would show Kiara and Kovu's relationship grow like that. Odds say that you are very likely to be right, and you are if their love and relationship doesn't grow with time, but it could. I really like your theories! And this is mine. I personally think that Kiara wanted Kovu to rule along side her, but she was already betrothed and Kovu didn't trust himself with that kind of responsibility(and neither did Simba or Vitani), so he just decided to mate with her and bare her children, and the oldest of their children would be the next ruler after Kiara and her betrothed. She was betrothed to someone else in her childhood, the same way Simba and Nala were betrothed when they were cubs, so whoever Kiara was betrothed is who became Prince Consort. That is an interesting standpoint. So............yeah, for the good of the pride. Good points. Plus lions in real life kinda fight a lot, especially during mating time. Sometimes male and female lions don't really like being around each other. In one video I saw by Big Cat Rescue a male lion was trying to lie down next to a female and she was growling a lot and was trying to bite and claw him. It was funny though because the male was really fluffy because of the mane and he reminded me of my sister's cat Harry, who is also really fluffy. He's a mini lion. I recently rewatched TLK2, and it hit me how unrealistic Kiara and Kovu's romance is. I mean, I do like how Kovu starts to open up as they bond as young adults, but for Kiara to rememver Kovu all those years later, when they had only met for a few minutes is just... what? I get him remembering her, because he was trained to. Also, Kovu would probably (unintentionally) manipulate Kiara pretty bad as their relationship went on, simply because that's what he was trained to do. Well, theoretically, Zira adopted at least one, if not all, of her children. 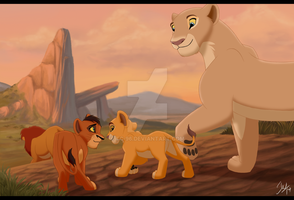 Theory/popular headcanon is that Vitani is Nala's daughter, Kovu is someone else's son, and only Nuka is her biological child. Of course... to my knowledge, there's nothing to back that up. If you read the description, the only one leaving is Kovu, and this isn't even canon, nor does it have anything to do with men as a whole. Saying you hate men because of a piece of fanart is excessively close-minded. The creator of this artwork already knows this. Doesn't mean they can't question the logic. I agree with all of this. I personally think that they would stay together, but it all makes sense. And I'm not going to deny it. You're right about all of this. I love the artwork, and the concept is really interesting and innovative. But about Simba and Nala- if ever Nala feels lonely, she'll at least have Kiara, i. e. when she is NOT wandering around her future kingdom. Nala actually has a bigger role than she ever did in the first movie. She's the voice of reason for Simba and is more open and accepting, something that her mate needed to learn. It takes a strong person to forgive others than to condemn them, and an even stronger one to not rely on what one thinks X would have done. TLK 2 actually fixed one of the problems of the first film: underrepresentation of female characters. Kiara is the heroine, Zira is the villainess, and even Vitani has important scenes. Sarabi and Shenzi get dropped, but it is a step-up to have four major females. Kiara and Kovu did connect at the start; they wanted to be friends, and they literally had nothing to do with the initial circumstances that made their parents hate each other and warrant their separation. They likely knew this but couldn't communicate it; they finally did as adults when it really hit the fan. "You will NEVER be Mufasa!" "I want nothing more to do with [Scar]!" Kovu's transition to the good guys is believable because he is shown rather than told; actions speak louder than words, after all. He was supposed to pretend to "save" Kiara to earn trust, but spending time with the Pridelanders and being shown genuine kindness (along with the fact that there is more to life than being a killer for the sake of killing) made him less and less willing to kill. It wasn't instant, either, so it's not contrived. It seems to support the relationship with Kiara and Kovu even better because they see reason much quicker than anyone else did. They're wise beyond their years. And if you remember from the first film, Simba said that he will do away with the arranged marriage law. In TLK 2, there's no such law in sight anymore, so there's no way he would get another suitor for Kiara, not that she would want one anyway. TLK 2 wasn't all about Kiara and Kovu, it was also about Simba dealing with his inner demons that still haunted him. After losing a family member from blindly trusting someone, can you really blame him? He didn't want his daughter to go through the same thing he did, or worse. He had good reasons, but was very antagonistic and extreme going about it. He almost ended up going off the edge and would have become the very thing he hated had Kiara not saved him in time. Very disturbing implications if you think about what would have happened otherwise. The big lesson everyone in the movie had to learn is that they needed to recognize the greyer shades of morality beyond black-and-white, which is a strong message for a Disney film at the time. I actually think your argument makes plenty of sense!